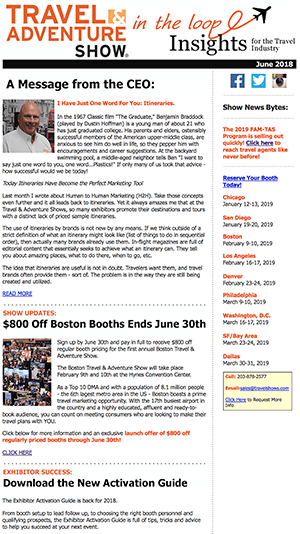 The Travel & Adventure Show’s newest communication initiative “T&AS In the Loop” was developed to keep our exhibitors informed of all of the opportunities and happenings, best practices and case studies surrounding the Travel & Adventure Shows. Please let us know what you think! Email Jonathan Golicz at Jonathan_Golicz@Unicomm.org for details. Call for Photos and Case Studies! Take a photo with your Travel & Adventure Show gear “wherever” you are in your destination and we will showcase it in our upcoming newsletters. Share Your Success Story with T&AS, tell us new ways you are utilizing the show, what the results were, etc. All exhibitors can learn from each other.